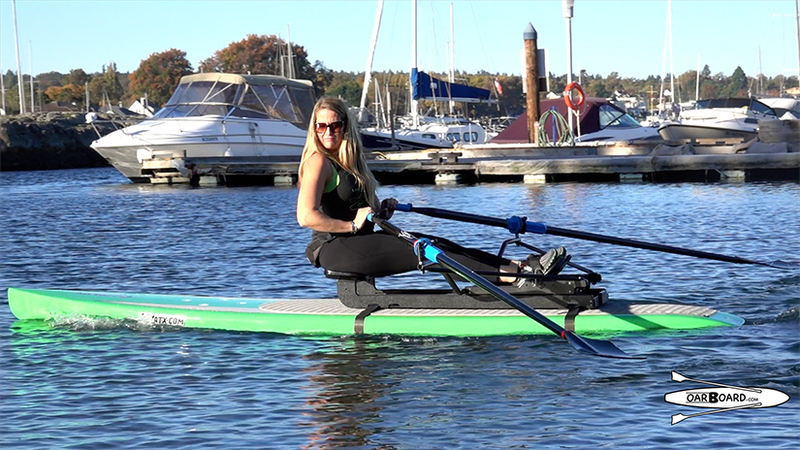 It’s always fun to help produce another video that helps people understand more about rowing with the Oar Board®. Check it out! It’s posted below! Here’s my blog on it. 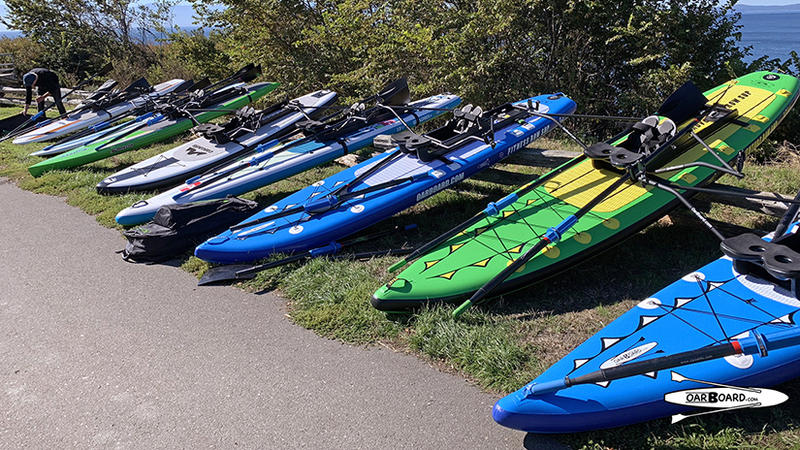 As the sales manager for the Oar Board®, I often get asked about which paddleboards work with the Oar Board® Rower, so here is a breakdown of some of the most common types of paddleboards and how well they work to row. 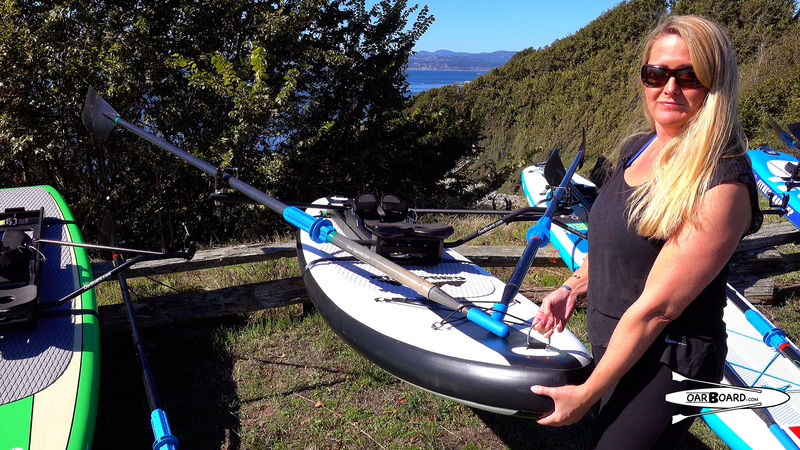 The Oar Board® itself is a compact and lightweight rowing unit that attaches to almost any paddleboard turning it into a very cool rowing boat in just minutes. The Oar Board® will fit onto almost any board over 3 meters or 10 feet long. To attach the Oar Board® to the paddleboard, you simply strap it down with thin straps, that snap in place with a stainless steel buckle, and cause no noticeable drag. I have been working with the Oar Board® since the beginning and we are the designers as well as the builders. We know the Oar Board® inside and out and love every bit of it. We have shipped it to happy customers in over 55 countries and don’t plan on slowing down anytime soon! 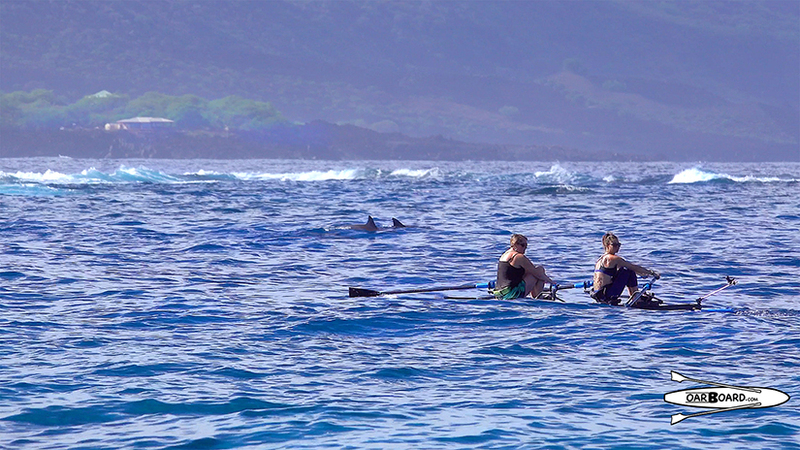 Before we get to the paddleboards themselves, I wanted to mention our two-part sculling oars. 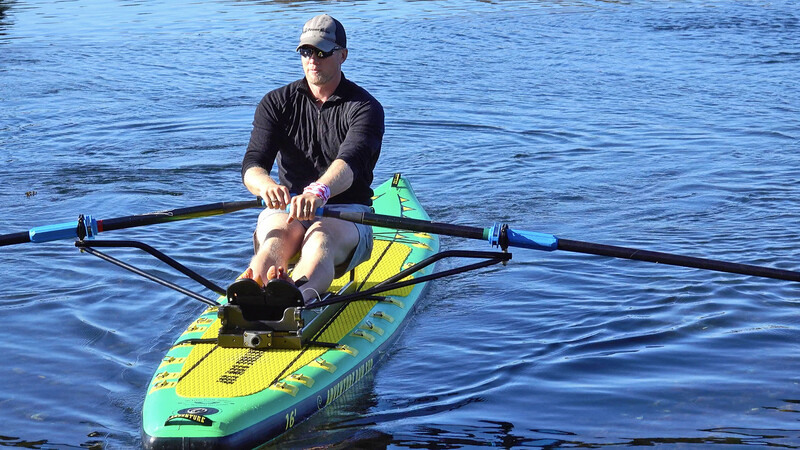 We designed these specifically to go with the Oar Board®. They are made of ultra-light carbon fiber and because they can break down into two pieces, they make storage, packing and travelling a breeze! The Oar Board® also breaks down for travel and both the oars (in their own oar bag) and the Oar Board® fit into the Travel Wheelie Bag. This means you can keep them together at the cabin, under your bed, on your boat, or as checked luggage on route to your next rowing destination! Now let’s have a look at some different types of paddleboards the Oar Board® works with, starting with hard boards. This board (see picture) is an inexpensive 10 foot fiberglass Costco hardboard. It’s very common and popular. In the video below you can see that it rows very well. In fact most low budget hard boards over 10 feet are just fine for recreational rowing for fitness and fun. Next, we have a 12 foot board (see picture), also fibreglass, although this board has a bit more curve or ‘rocker’ to the hull. Boards like this one are intended for paddling in waves and surf but as you can see in the video, they also row very well. Another type of board that’s available is a touring board. You can see in this image that the touring board has a flatter shape and a more pointed nose. This shape allows it to row a little smoother with more glide. 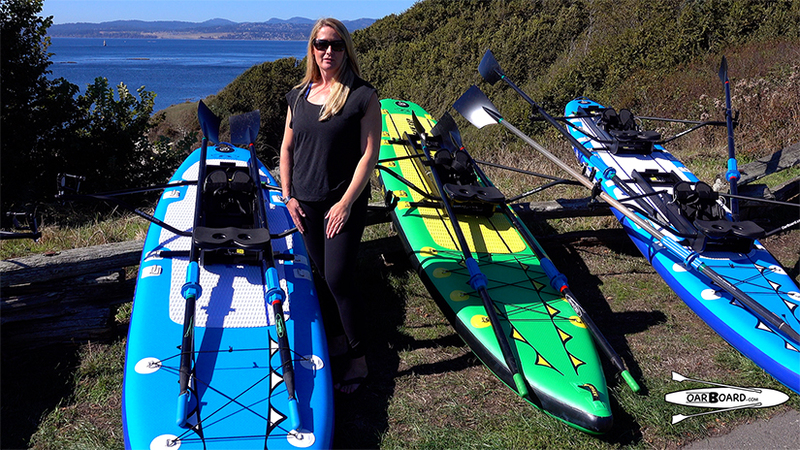 Most brands of hard fiberglass paddleboards row really quite well with the Oar Board®. Now let’s have a look at inflatable paddleboards. Inflatables are very handy because when they are deflated, they can be rolled up and fitted into a backpack for storage or travel. Even better is they can handle bumping up against things without damage much more so than a hard board which can be dinged or damaged very easily. 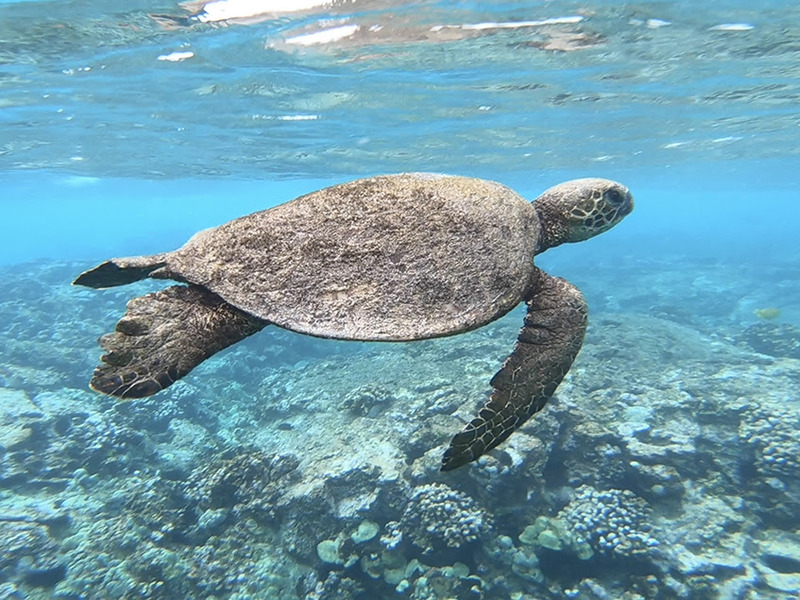 Some of these inflatables have three fins on the back and on a shorter paddle board, this means that the Oar Board® may need to be repositioned a little further forward to keep the back strap free of the fins. When mounted on any board the back of the seat needs to be located on or just behind the lift handle. 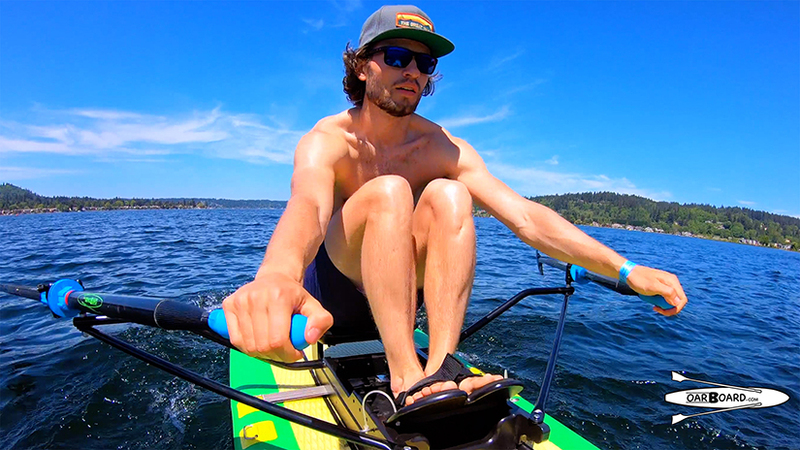 This is a great time to mention how the Oar Board® is designed for the smoothest possible ride. 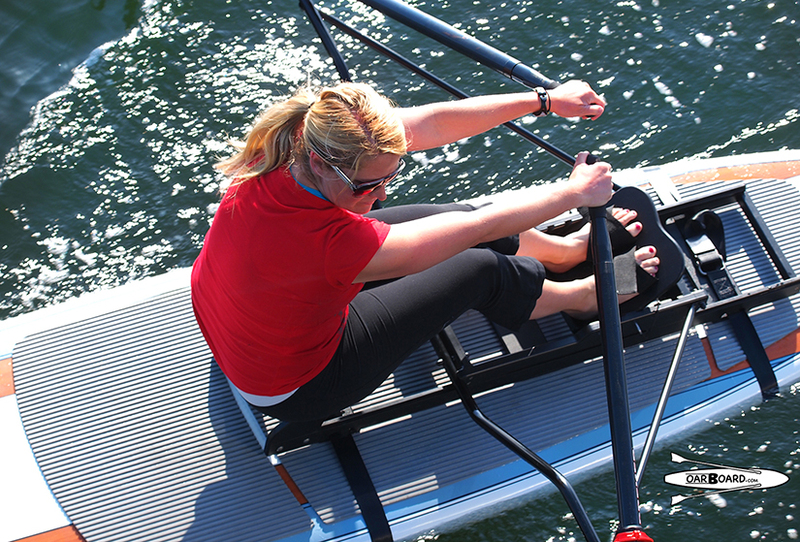 The sliding rigger set up allows the rowers’ weight to remain centered so there is no pitching or hobby horsing. The sliding rigger system has been around for a long time and the stroke itself is identical to the traditional slide seat rowing stroke. 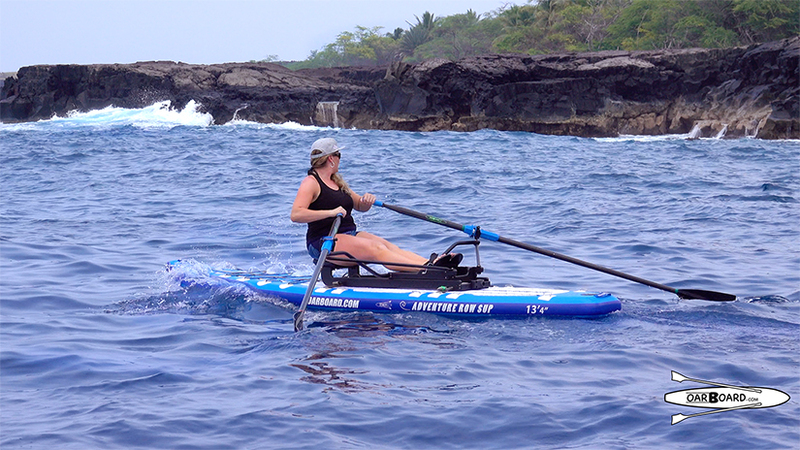 The 12’ inflatable Red Paddle brand is very popular, and rows well with the Oar Board® Rower. There are hundreds of brands of inflatables available that all work well with an Oar Board®. We have three of our own paddleboards designed specifically by Harold Aune to go with the Oar Board®. These are the Fitness and Adventure Row Boards. They are high-quality inflatable boards and feature special deck rings so the straps do not need to go all the way around the board and you know your Oar Board® position is always right. 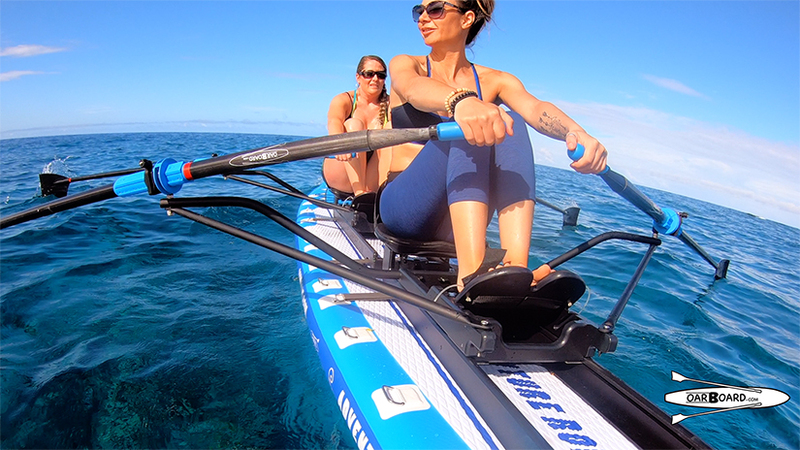 First, there is the Fitness Row 12’ board, perfect for all-around fitness be it rowing, paddling, or even yoga! Blog 12 Next, the Adventure Row 13’4 which is a touring board, great for exploring and good for rowing in waves and wind. And finally, we have the Adventure Row 16’ which can be set up as a double or a single! 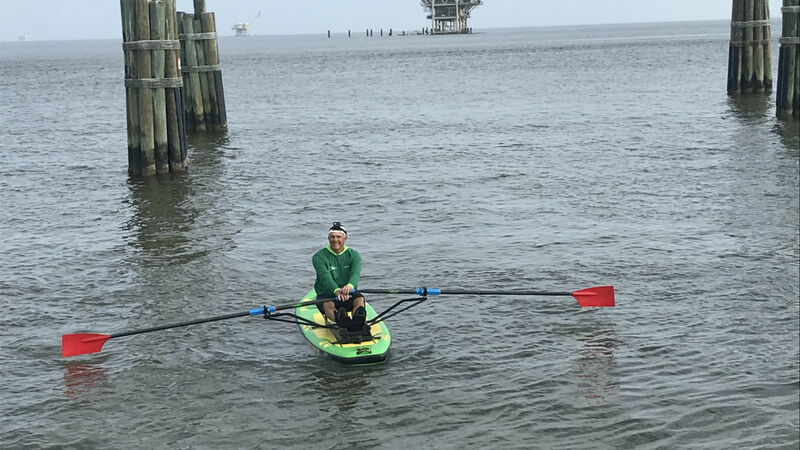 This has just been a very brief introduction of the paddleboards out there and picking one to use with the Oar Board® fit-on-top Rower. More information and videos are available at OarBoard.com where, if you’re new to the sport you can also check out our ‘How to Row’ videos. Thanks for reading, hope you enjoyed the video! Contact us on our chat line, phone, email or social media channels.